'Dossie'.- Self Silver (Chinchilla) female, owned by Mrs. Wellbye. Photo: E.Landor, from a Wrench Series Postcard 5716, printed in Saxony, circa 1904, courtesy of The Harrison Weir Collection. 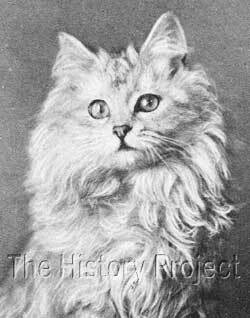 If it had not been for Frances Simpson writing The Book of The Cat, published in 1903 by Cassell & Co, it is highly likely that 'Dossie' would simply have remained an unknown enigma. 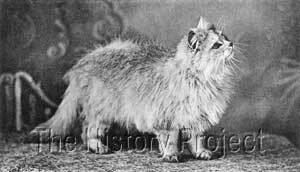 From her pedigree, she was a modest cat of no particular fame and no obvious significant heritage, but as a brood queen she proved to be of immense value. She was fortunate in having a wise owner who chose not to waste her, but to carefully and selectively breed her to some of the best foundation Chinchilla bloodstock available. Using horticultural terminology, she could invariably be described as an excellent 'root stock', which when correctly cultivated, becomes the basis for a more spectacular specimen. In many ways, her success as a brood queen very much emulated that of her peer, 'Windsor Dimity' a female sired by the worthy 'Ch. Lord Southampton', who was also an excellent brood queen and the consistent producer of famous Silver Persians. Unlike Dimity, she did not have the competitive advantage of pedigree and yet her achievements were no less outstanding. 'Dossie' was born on 28th April 1896, bred by Lady Fitzhardinge and picked up as a potential breeding queen by Mrs. Wellbye. 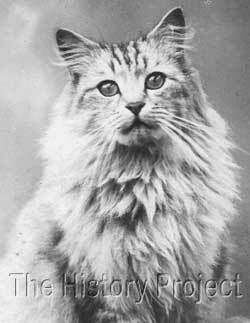 Her sire is listed as 'Mr York' (c1893) who was himself sired by 'Charlbury Silver King' (1890), a Silver Tabby by Ch. Perso ex Beauty of Bridgeyate and therefore a full sibling to Ch. Silver Lambkin! Her dam was 'May' (of mostly unknown background). Although neither of her parents were of any particular note in themselves, this critical link in her heritage behind her sire, would have far-reaching consequences when she was bred. Dossie's legacy was solely through her amazing progeny. In some databases, 'Dossie' is listed as a possible dam sibling to her own sire, 'Mr York' both being listed as out of 'May'. So this would suggest that she may have been the product of a mother to son breeding. 'Dossie's' legacy to the realm of Silvers and the cause of the Chinchilla was solely through her amazing progeny. The second female from this breeding was a top show specimen, and was originally sold to the very experienced silver breeder, Mrs. Bluhm.2 'Silver Lily' was both a quiet achiever on the show bench and as a breeder. 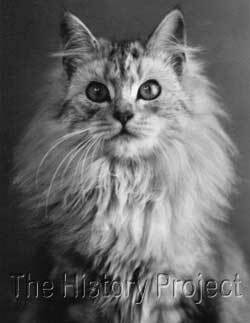 One only needs to view the full studio photograph of 'The Silver Lily' to appreciate what a stunning cat she was for the period. Clearer coated, of fine stature and grace, 'Lily' was a clear front-running representative of the emerging breed. At the end of her breeding career, she became the property of a Miss Simon. In the above two photographs we are shown 'Dossie's daughters' but which? 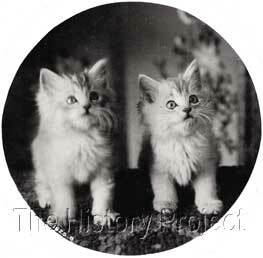 In an alternative pairing of photographed kittens from a later litter to a male called 'The Silver Squire', these are always denoted as 'The Daughters of The Squire', but in this case, the appellation is simply 'Dossie's Daughters'. So we are inclined to believe that in this case, the above images are representative of the baby 'Jessamine' and 'The Silver Lily'. Certainly the kitten on the right in the first photo above is the clearer coated and the kitten shown in the second image is one and the same kitten. Comparing the adult photos to the kitten photos, we are therefore inclined to accept that the kitten on the right is 'The Silver Lily' as a young kitten. 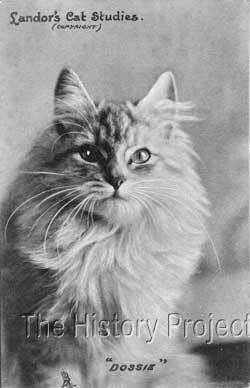 In 1898, Mrs. Wellbye chose to try a variation, and this time chose to breed 'Dossie' to another of Mrs. Balding's males, a son of 'Ch. Silver Lambkin' known as 'The Silver Squire'. This was a move with exceptional foresight, as 'Silver Squire' was the product of a half-brother to half-sister mating, doubling on the dam of 'Ch. Silver Lambkin' himself. When she had bred 'Dossie' directly to 'Ch. 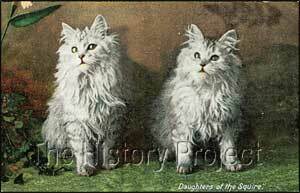 Silver Lambkin' and produced both 'Jessamine' and 'The Silver Lily', she had simply doubled on 'Ch. Silver Lambkin's' dam, through Dossie's grandsire, 'Charlbury Silver King'. But by choosing to breed to 'Silver Squire', she was in fact choosing to TRIPLE exclusively on 'Beauty of Bridgeyate'. 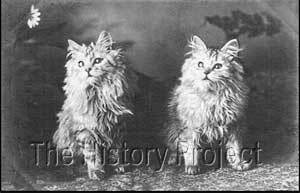 From this breeding came two more females and a male, the females being photographed extensively by E.Landor(Ealing), both as kittens and young cats and who became well known simply as "the daughters of The Squire". The male was registered as 'Lucifer', but although he is listed under Mrs. Wellbye's name, there are no photographs extant and no records of any progeny. Both females however, were shown very successfully but one in particular, was a favourite of Mrs. Wellbye and of which she was extremely proud. This was 'Silver Lotus', whom she regarded as one of her best, and who was consequently also referred to as 'The Light of the Harem'. 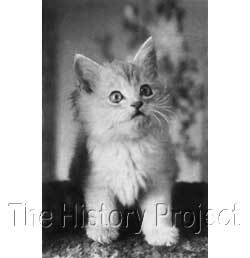 Postcards of both exist, separately and together as kittens and cats along with their associated nicknames. 'Silver Lotus' litter sister, 'St.Veronica' (also known as 'Silver Veronica') is probably the least publicly known of 'Dossie's 'daughters' and the least photographed, but she appears on the postcards jointly with more recognisable sister. Head-wise, they are strikingly similar, but just as 'Silver Lily' was lighter than her litter sister 'Jessamine', so too was 'Silver Lotus', lighter than her littermate. The difference however was not quite as extreme in the litter from 'The Silver Squire'. The 'Daughters of The Squire' & 'Dossie' together. The very handsome vignette shown below comes from page 49 of The Book of the Cat (1903) by Frances Simpson, at the head of Chapter IV, 'The Housing of Cats'. This is we believe , another photograph in the series on 'The Daughters of The Squire', only in this case, 'Silver Veronica' is on the left side, laying down, while 'Silver Lotus' remains upright behind her. 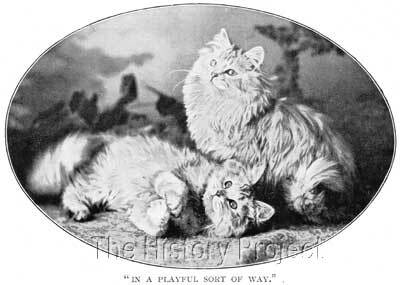 This image has also been published widely as a postcard, with the captions, 'In a playful sort of way' and 'Coax Me'. The 'Coax Me' image is published by a Boston-based Postcard company. The unqualified success of this breeding did not go unnoticed. Mrs. Balding, having seen 'Dossie' and knowing her background, would have recognised immediately the potential of her young male 'The Silver Squire' to be line-bred back to any queen of quality that already possessed a liberal amount of 'Beauty of Bridgeyate' blood. 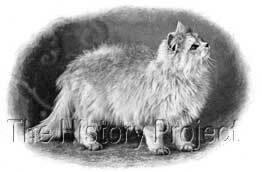 Mrs. Martin owned the valuable silver female, 'Lambkin Queen', one of the famous daughters of 'The Nizam' and 'Beauty of Bridgeyate', and this queen had produced a fine female kitten in February 1898 in the form 'Silver Blossom' sired by a silver male named 'Saint Anthony'. There is little room for doubt that Mrs. Balding is likely to have encouraged Mrs. Martin to breed her valuable female to her own 'Silver Squire', to obtain the same TRIPLING of 'Beauty's' bloodline. From the resulting litter came the well-known female 'The Squire's Daughter'. 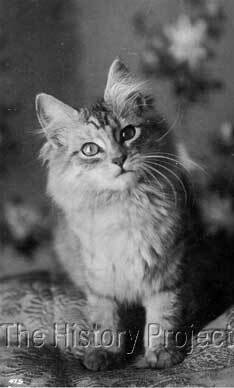 In 1899, Mrs. Wellbye seems to have taken the decision to repeat the breeding which had produced 'The Silver Lily' possibly in the hope of producing another like her, but on this occasion the kitten retained was a male. By this time, the sire, 'Ch. Silver Lambkin 'was 10 years old, so Mrs. Wellbye is likely to have retained a male as a back-up option. No-one could have guessed at that point in time, that 'Ch. Silver Lambkin; had another good 7 years ahead of him. 'Silver Monarch' would have been considered a lynchpin for future breeding plans, the perfect male to bring outcrossed silver queens back to. As such was truly considered to be 'the King of the Cattery' and 'Monarch' of all he could survey. Sadly however, some unforeseen circumstance must have taken him out of the picture, for we can find no evidence of resulting progeny. Like his older siblings and half siblings, he was duly photographed by Landor, as a youngster and then as a mature male. 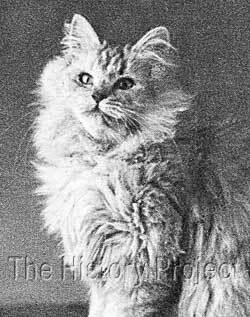 His photos show a cat which, although resembling is ultra-famous sire, also vividly display his bold eyes of rich intensity. Above: Two images of Dossie, both based upon a photograph by E.Landor, of Ealing. Photo credits in text. Images courtesy of The Harrison Weir Collection. Here we have two photographic images of 'Dossie' as a young cat, the first is from the 'Landor's Cat Studies Series' published by Raphael Tuck & Sons, as an 'Art' Postcard8?. The second is from a Rotary Photographic Series, plate sunk Postcard4. As can be seen in these images, 'Dossie' was of only moderate type, with relatively large close set ears, and also displaying immature coat colour. It was common for the silvers of this period to start out darker and to lighten considerably as they aged. By comparing these two images of 'Dossie' with the two above as a more mature cat, you can see how that transformation took place. Then when compared to her progeny, you can see both similarities and the result of partial line-breeding upon the lines behind Champion Silver Lambkin. In summary, 'Dossie' can now been seen in a new and different light, when we review the results of her breedings with 'Ch.Silver Lambkin' and 'The Silver Squire'. Postcards of her progeny are still bought and sold 115 years later, demonstrating the enduring popularity of the images. 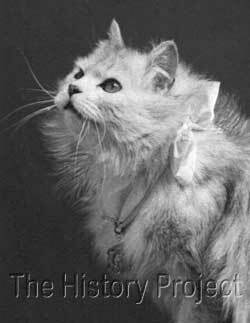 Her legacy also lives on in the many silver Persian cats that are descended from her famous children and we can but only wonder, that such a modest little cat was capable of doing so much to enhance the ever-rising popularity of the Chinchilla. The Book of the Cat by Frances Simpson, 1903. The National Cat Club Register. Rotary Photographic Plate Sunk Series Postcard. Studio Photograph by W.Muntz, Southport. Raphael Tuck & Sons Art Series Postcard. Rapid Photo, 'Classic Series' Postcard. Wrench Series Plate Sunk Postcard.